Publishers increase interest in Indesign Magazines to limit their overhead costs, deliver content faster and build relationship with readers on wider variety on mobile devices. 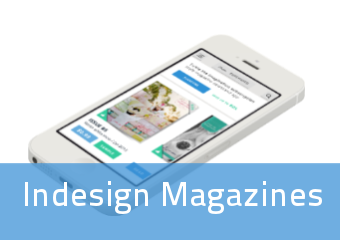 Why publishers need Indesign Magazines? Publishers of all sizes can benefit from using Indesign Magazines in their day-to-day workflow. For one going mobile enlarge number of ways readers can access your publication. Secondly publishers that previously were operating only locally now can reach new markets without enormous costs of doing so 10 years ago. Lastly publishers can be one of the first in their category, therefore gain significant advantage over late adopters. This is not only limited to big publishing companies. Introduction of App Store Newsstand and Google Play newsspaper and magazine categories allowed small publishers compete with big companies on equal rights. Final call is made by readers around the world. They vote with their credit cards. Use of Indesign Magazines and fast adoption of iPads and Android tablets democratize publishing market and help small and medium publishers in a way that was simply not available to them few years ago. When Apple introduced the iPad in 2010 very few small publishers thought they can compete with big titles. What has happened since then surprised experts and media all around the World: rise of Indesign Magazines helped mostly small publishers, while big media corporations fall behind or got stuck with custom build solutions that aged fairly quickly. When you do the math and recap all of the costs, moving magazine mobile can end up very expensive. There all those costs that normally don't occur when you thing about magazine or a newspaper: hiring IT guys, setting up an infrastructure, managing software developers, designing for mobile, UX and UI testing, and so on. Publishers choose Indesign Magazines to reduce all this cost, but more importantly to focus on what they do best – creating great and original content for their readers. PressPad sees significant grow in the magazine category over last couple of month. The tool delivers a holistic approach to mobile publishing. With it Publishers can simply upload their content online, click "publish" and have a dedicated iPad and Android application ready. Try PressPad free.